(Nanowerk News) University of Oregon chemists have devised a way to see the internal structures of electronic waves trapped in carbon nanotubes by external electrostatic charges. Carbon nanotubes have been touted as exceptional materials with unique properties that allow for extremely efficient charge and energy transport, with the potential to open the way for new, more efficient types of electronic and photovoltaic devices. However, these traps, or defects, in ultra-thin nanotubes can compromise their effectiveness. Using a specially built microscope capable of imaging matter at the atomic scale, the researchers were able to visualize traps, which can adversely affect the flow of electrons and elementary energy packets called excitons. The study, said George V. Nazin, a professor of physical chemistry, modeled the behavior often observed in carbon nanotube-based electronic devices, where electronic traps are induced by stochastic external charges in the immediate vicinity of the nanotubes. The external charges attract and trap electrons propagating through nanotubes. George Nazin, University of Oregon. "Our visualization should be useful for the development of a more accurate picture of electron propagation through nanotubes in real-world applications, where nanotubes are always subjected to external perturbations that potentially may lead to the creation of these traps," he said. 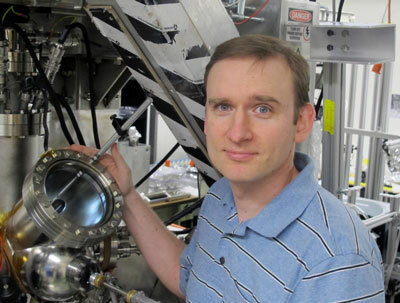 The research, detailed in a paper in the Journal of Physical Chemistry Letters ("Vibrational Excitation in Electron Transport through Carbon Nanotube Quantum Dots"), was done with an ultra-high vacuum scanning tunneling microscope coupled to a closed-cycle cryostat -- a novel device built for use in Nazin's lab. The cryostat allowed Nazin and his co-authors Dmitry A. Kislitsyn and Jason D. Hackley, both doctoral students, to lower the temperature to 20 Kelvin to freeze all nanoscale motion, and visualize the internal structures of nanoscale objects. The device captured the internal structure of electronic waves trapped in short sections, just several nanometers long, of nanotubes partially suspended above an atomically flat gold surface. The properties of the waves, to a large extent, Nazin said, determine electron transmission through such electronic traps. The propagating electrons have to be in resonance with the localized waves for efficient electronic transmission to occur. "Amazingly, by finely tuning the energies of propagating electrons, we found that, in addition to these resonance transmission channels, other resonances also are possible, with energies matching those of specific vibrations in carbon nanotubes," he said. "These new transmission channels correspond to 'vibronic' resonances, where trapped electronic waves excite vibrations of carbon atoms forming the electronic trap." The microscope the team used is detailed separately in a freely available paper (High-stability cryogenic scanning tunneling microscope based on a closed-cycle cryostat) placed online Oct. 7 by the journal Review of Scientific Instruments ("High-stability cryogenic scanning tunneling microscope based on a closed-cycle cryostat").